New Mexico green chile nuts like us might find it difficult to settle for regular old ratatouille after this Green Chile Ratatouille because, frankly, it will taste like something’s missing. Something important. Which it will be. 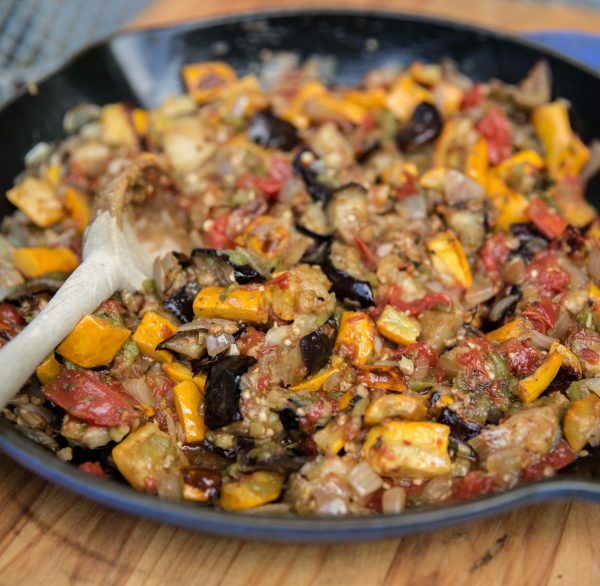 Without the green chile, ratatouille can taste a little dull. Funny how those smoky, earthy, spicy peppers get under your skin and just ruin you for regularly seasoned foods. Green Chile Ratatouille is a natural for showcasing the coveted New Mexico pepper because all the vegetables in the dish are in season during the summer harvest of chile. The vegetable quantities are quite forgiving. Use our recipe as a rough template and just use what you have. If you don’t have good fresh tomatoes, a drained 15-ounce can of diced tomatoes works fine, roasted or not. This hearty dish makes an excellent meatless meal and pairs nicely with simply grilled meat or fish. Grilled bratwurst also good, as are lamb chops, skirt or hanger steak, and shelf chicken. Serve Green Chile Ratatouille warm or at room temperature. Makes a delicious chunky spread for crusty grilled bread. Preheat the grill to high heat. Place the squash and tomato in an aluminum foil pan (keep them on separate sides). Place the eggplant in second foil pan. Drizzle both pans of vegetables with olive oil and toss to coat evenly. Sprinkle with Kosher salt. Place the foil pans on the grill and close the cover but leave it ajar for steam to escape. Grill roast the vegetables until soft and lightly browned, stirring occasionally, 20 to 30 minutes depending on your grill’s BTU output. If the eggplant sticks to the pan gently free the pieces with a spatula. The eggplant won’t take as long to cook as the squash and the tomatoes. Meanwhile, cook the onions in a large skillet over medium-high heat until softened. Add the garlic and cook an additional few minutes, but don’t let the garlic burn (unless that’s how you like it). Add the grilled vegetables, oregano and green chile and toss lightly. Heat through and serve. Makes 8 servings.